We have a lot of uses for empty feed bags, but my favorite is kill mulching around small transplants. As you can see in the photo above, the parts of the garden that spent the winter as rye are a little weedier than I'd like, so rather than hand-weeding, I'm laying down a layer of paper bags and then a layer of straw. The feed bags conform to the soil surface better than cardboard does in this type of uneven terrain, and they decay just as fast (including the strings). When we go somewhere other than our usual feed store and end up with the plastic-burlap bags, I generally save the empties for troublesome trash. We're still pulling old barbed wire and broken glass out of parts of the garden, and that type of debris will puncture an ordinary trash bag. A plastic feed bag, though, holds wire and glass with ease. What do you do with your old feed bags? My neighbor, who recently went to a family reunion in Germany,told me that they charge for each plastic bag a person gets, when buying something. Elizabeth --- The exact same thing happened to us this winter, and I'm pretty sure the culprit is voles. I vaccillated and ended up just mounding up earth around the base of the trunk above where the voles gnawed, hoping the trees would reroot. One of our trees is definitely dead, and two look like they might be making a slight comeback. If they stay alive, I'll probably prune them hard so they don't have so many branches in relation to their few roots, and I'd recommend you do the same. If ours had set any fruits, I would also pick all of them off. Since yours is in a bucket of water, rooting, I'd probably cut it way back, then put it in a pot in a shady location, watering often, as soon as you see roots (now). The tricky part will be making sure that you keep it well enough watered without drowning it. Basically, you're turning the whole tree into a softwood cutting, so it will need lots of babying to stay alive. I'll be curious to hear what happens! Ok. Do I guess I'll pot it up, cut it way back (with my eyes closed so it doesn't hurt so bad) and water enough to help the roots establish but not so much to kill it. Well, this WILL be a challenge! I'll let you know how things go! wow, good luck with the tree! re uses for feed sacks, the paper ones make great "disposable" floor mats for the farm truck, if you tend to have work boots tracking in mud, grass clippings, straw, etc. When they get too dirty, just pull it out, put a new one in, no big cleaning job. They're still good at that point for sheet composting or recycling, too, so no harm done. The bride takes feed bags and cuts a strip off the top and sews it on as handles for reuseable shopping bags. 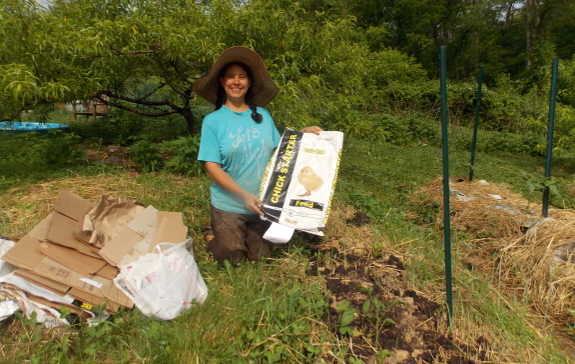 I pack composted manure in bags and give them to area gardeners.